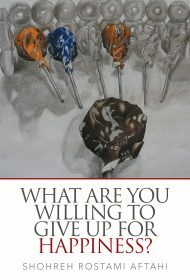 In What Are You Willing to Give Up for Happiness? author Shohreh Rostami Aftahi shares her personal quest for self-betterment through family experiences and brief stories from her work as, presumably, a job coach, although she never clearly identifies herself as such. Using real-life examples, she shows why it is best to encourage others to “own” their behavior, rather than trying to force them to change. Aftahi’s tone is professional, and her advice makes for a quick and interesting read. But at 52 pages, What Are You Willing to Give Up for Happiness? feels more like a booklet than a thorough how-to. It would have been useful to hear more about her career path, professional qualifications (only halfway through the book does she mention her MBA and PhD, with no details) and how she learned to detach in times of conflict. Still, What Are You Willing to Give Up for Happiness? serves as a great little guidebook for corporate employees and other readers, who will undoubtedly welcome her ideas on how to handle relationships at work and at home. Also available in hardcover and paperback.